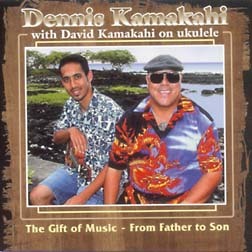 -- From Father to Son"
If there is one word that describes Kamakahi's latest album, it's simplicity. Kamakahi sings and plays exquisite slack key guitar, with son David adding backing vocals and a little ukulele. Most of the songs are Hawaiian standards and all are played in that beautiful nahenahe style. It's like the two of them are right there in your living room. Kamakahi has been a major figure in Hawaiian music for several decades and could've easily gotten an outside distributor to market this album for him. Instead, he's decided to make it available only at his concerts and through his Web site at denniskamakahiproductions.com. Kamakahi's years as a researcher of Hawaiian music is evident in the presentation. Each song is preceded by a narrative track that explains the significance of the song or the circumstances that inspired it. 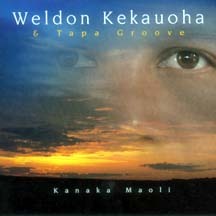 Weldon Kekauoha & Tapa Groove is, in fact, the Mana'o Company, less founding member Danny Kennedy. 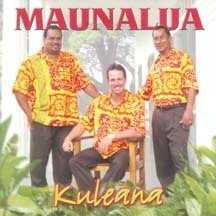 With Kennedy gone, the group retired the old name and Kekauoha has become its star vocalist and primary composer. "Kanaka Maoli" is a perfect debut by the quartet, and the title song is the most memorable new English-language song from a local act thus far this year. The song combines a dark retrospective on Hawaiian history with a smooth, bluesy arrangement that is far more soulful than most local efforts. Kekauoha also writes in the familiar Jawaiian style that appeals to a large chunk of their old fan base, while five contemporary Hawaiian-language songs from Kainani Kahaunaele allow the guys to display their range and acknowledge their island roots. Watch as this album becomes one of the year's biggest local releases. A beautiful remake of "Hawaiian Soul" is the surprise song on the long-awaited second album by Maunalua. The trio's debut album won a Hoku back in 2001 and their work here is just as good. Guitarist "Uncle Bobby" Moderow's smooth falsetto may make him first among equals, but Bruce Spencer and Kahi Kaonohi are clearly full partners in creating the beautiful three-part harmonies and clean acoustic arrangements. Several songs, performed as instrumentals, showcase the trio's prowess as musicians and female falsetto singer Leina'ala Haili adds a perfect fourth voice on "Pua Tuberose." The liner notes explain that it is the kuleana of Hawaiian musicians to ensure that the foundations of their music remain strong -- which only makes the omission of printed lyrics and cultural background for each of the songs that much more glaring. section on Fridays for the latest reviews. Contact John Berger at jberger@starbulletin.com.